Nordic crime fiction is one of the major trends in contemporary film and television with successful Nordic titles often prompting swift American remakes. If you want to go back to the source of many of the celebrated elements of the Swedish police procedural, the Martin Beck novels by Maj Sjöwall and Per Wahlöö offer a good place to start. This couple, good Marxist socialists both, wrote ten immensely popular police procedurals in the 1960s and 1970s featuring a Stockholm detective and his team. The stories all manage to critique what the authors saw as the flaws in Swedish social democracy. It is this political imperative which has survived in the work of Henning Mankell and others. All the books were made into films or TV series in Sweden and overseas. The best of the films is often said to be this 1976 adaptation by the celebrated Swedish director Bo Widerberg. 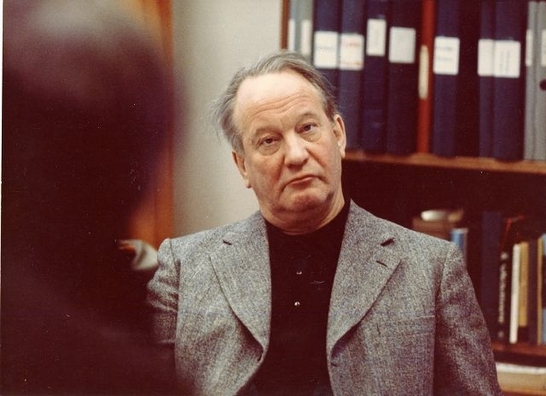 Widerberg was the young turk of the Swedish ‘New Wave’ in the early 1960s and one of the more radical directors who was critical of Ingmar Bergman’s status within Swedish film culture. The novel’s title is The Abominable Man – a reference to a police lieutenant who is lying in a hospital bed when he is attacked and brutally murdered, almost filleted with a bayonet. Martin Beck and his colleagues begin an investigation but just as they solve the mystery, the murderer takes to the rooftops with a selection of powerful snipers’ rifles and the police authorities have to devise a safe way of disarming him. 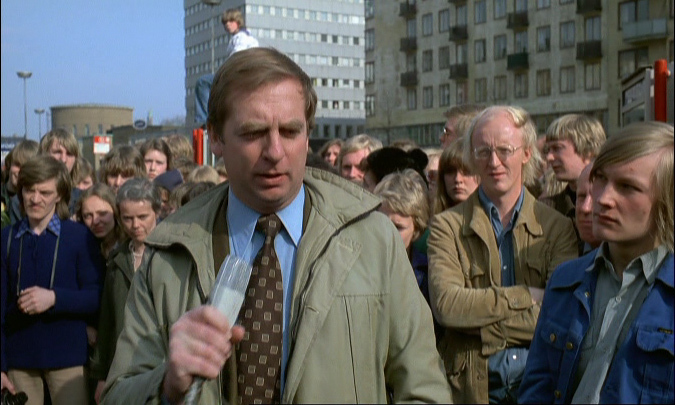 Carl-Gustaf Lindstedt as Martin Beck. Eastwood or McQueen he isn't, but not a police inspector to underestimate either. The key feature of the film is its realism. Widerberg shoots on location and the action sequences in the film have a strong documentary feel which is also evident during the long police procedural sequences. The casting of a leading Swedish comedian of the period Carl-Gustaf Lindstedt as Martin Beck and the sheer ‘ordinariness’ of the rest of the team adds to this ‘realism effect’. (Lindstedt was the son of a Social-Democratic Party politician and started his career in a socialist youth theatre group according to Wikipedia.) The film is generally very well thought of – bearing comparison with the best Hollywood crime films of the 1970s (comparisons are made with The French Connection). The critique here is not of police corruption in the Hollywood sense (i.e. drugs, extortion etc. ), but something more akin to the systematic failure of police teams to do their job properly – and then to cover up the evidence with collective amnesia and a refusal to take complaints seriously. This approach shifts the focus from a single rogue to the system itself. Overall I was very impressed with this film (presented on a Swedish Region 2 DVD with English subs bought online from Play.com). The quality of the transfer to DVD is very good. I was a Widerberg fan in the late 1960s and early 1970s but I don’t remember this getting a UK release. I did feel that one or two of the decisions during the sniper incident seemed a bit odd, but then I reflected on how Hollywood would have played it and concluded that the bungling of the Swedish approach is much more like real life and the mistakes we all make. It might be interesting to compare this with some of the other Martin Beck adaptations. After watching this, it doesn’t seem so surprising that Walter Matthau should have played Beck in the US adaptation of another Sjöwall/Wahlöö novel The Laughing Policeman (novel 1968, film 1973). The setting is changed to San Francisco and the character names are changed but the cast looks strong Louis Gossett Jr, Bruce Dern and Joanna Cassidy in a small role. Anybody seen it? This entry was posted in Nordic Cinema, Swedish Cinema and tagged crime film, crime thriller, Nordic Noir, police procedural. Bookmark the permalink.